Align, an over-the-counter daily oral probiotic supplement containing the probiotic strain Bifantis (Bifidobacterium infantis 35624), has been made available by Procter & Gamble. 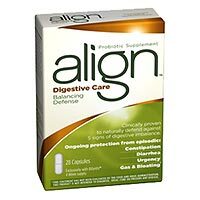 Align works by promoting the balance of healthy bacteria in the digestive system to provide a natural defense against episodic digestive upsets (eg, constipation, diarrhea, abdominal discomfort, urgency, gas, and bloating). It is available in a capsule formulation. For more information call (800) 208-0112 or visit www.AlignGI.com.